After spending the past couple of months poring over various 19 century census returns for Henham, I wondered what the village might have been like many centuries ago, like back to the Norman Conquest. My first stop was the County Record Office in Chelmsford where I found the antiquarian traveller Rev Philip Morant’s book ‘The History & Antiquities of the County of Essex’, first printed 1763-1768. He thought that the reference to ‘the manor of Henham’ in the Domesday Book of 1086 was the later site of Henham Hall aka ‘The Hall’. He recorded that in Edward the Confessor’s reign (1042-1066), the lands around Henham belonged to Ailid, to two freemen, and to one ‘sochman’ of Anfgar. He also noted that Domesday showed the lands to be held by Ralph Baignard (Baynard? ), Eudo Dapiser, and Geffrey de Magnaville. The 3 manors were Henham Hall, Plegdon, and The Broom. He said The Broom was 1 ½ miles southwest of Henham church. 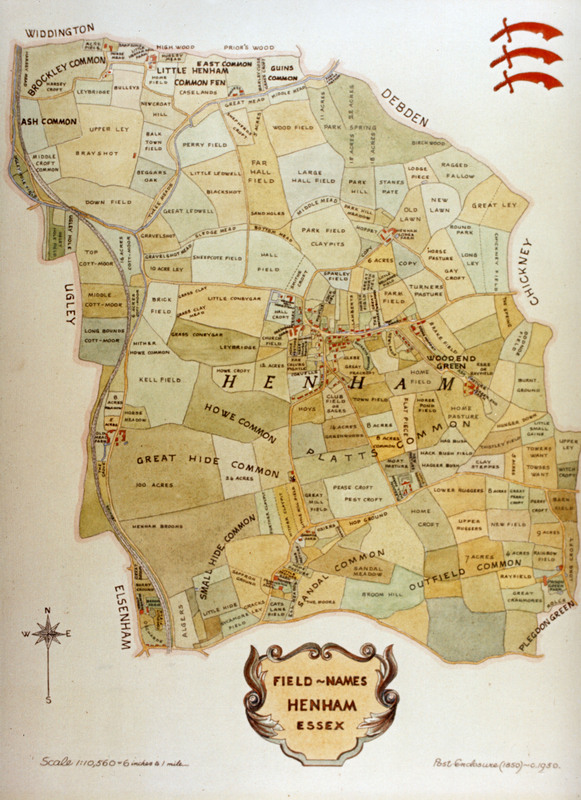 The well-known map of Henham Fields (there’s one in Elsenham Surgery) shows a field called ‘Henham Brooms’ in that position and Broom Farm Road in Elsenham commemorates this manor. Incidentally Morant identified the village estates in 1763 as being owned by William Canning of Old Mead Farm, Mr. Howard of Sandpits Farm, Thomas Mitchell, John Collin, George Guyver, William Jarvis, William Staines, John Newland, Joseph Hubbard, George Starkey, Michael Reed, William Mascall, John Willey, Edmund Sworder, Samuel Wood, and Ezekiel Dixon. Domesday records Henham as - ‘being in the half-Hundred of Freshwell. The manor of Henham, formerly held by Aethelgyth, was held in lordship by Ralph Baynard for 13 ½ hides less 10 acres. Then and later there were 18 villagers, 5 smallholders, 8 slaves, there was woodland with 200 pigs, meadow of 16 acres. Then and later there were 3 cobs, 8 cattle, 80 pigs, 160 sheep, and 16 beehives. The value of the manor had been £ 12. By Domesday things had changed ‘there were only 8 villagers but 38 smallholders; there were no slaves (author - although there’s been a few since, apparently within living memory! ); there were 4 ploughs in the lordship; there were 8 men’s ploughs. Now there were 8 cobs, 7 cattle, 100 pigs, 80 sheep, and 10 beehives. The value had increased to £20′. Ralph Baynard accompanied William the Conqueror to England and was given considerable lands, particularly in Essex. To help explain some of the terms above, ‘then’ meant at the time of the Conquest and ‘later’ meant after the Conquest up until the compilation of Domesday ‘Domesday’ comes from the Saxon ‘Dom’ meaning judgement or assessment. ‘Smallholder’ was a middle class peasant who farmed 10 - 20 acres, more land than a ‘cottager’ (no land which equates to we modern-day Vernons Close residents!) but less than a ‘villein’ (30-100 acres). ‘Sochman’ / Sokeman’ was the aristocrat of the peasantry. Nominally a freeman but with obligations to the lord of the manor, he could also attend the court of his Soke. ‘Sokeland’ was the land attached to a central manor for the payment of dues and for judicial purposes. ‘Plough’ normally meant a team of eight oxen so the 12 teams recorded at Domesday may have required over a hundred oxen to be kept in the village. Highly fertile areas could support at least 4 ploughs per square mile and this measurement is taken as being the most accurate guide to the capacity of a manor. Meadows were primarily for haymaking to provide the animals winter-feed. A regular water supply was essential so such fields were normally sited close to a river or stream. 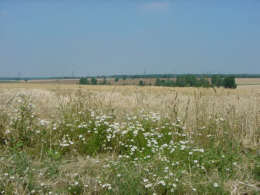 As Henham is surrounded by a number of streams, the meadow of 16 acres is particularly difficult to locate. From the livestock figures in Domesday, Henham seems to have bucked the trend during the period 1066-1086 when most of Essex saw increases in livestock. That increase is a bit of a puzzle since the Anglo-Saxon Chronicles record some appalling weather at this time especially cold winters and wet summers with widespread diseases amongst animals. ‘Hundred’ was a unit of fiscal assessment and local government and originally contained a hundred ‘hides’. It would be roughly equivalent to a modern District. ‘Hide’ originally meant the amount of land necessary to sustain a family. However it was often used as a guide to value as much as to area. In Domesday, the ‘hide’ was a fiscal unit on which Danegeld had been levied, although it was generally assumed to contain about 120 acres. But this measurement could vary considerably, between 40-1,000 acres, across the country. 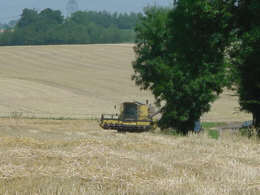 By custom a ‘hide’ was the land that could be cultivated by one 8 - ox plough team in one year. The hide’s relationship to our modern measurement is generally considered very approximate. To quantify our population at that time I converted ‘Domesday-speak’ into modern measurement. Domesday says that Ralph Baynard’s lands in Henham were 13 ½ hides less 10 acres which should be about 2 ½ square miles ((13.5 hides x 120 acres 10 acres / 640 (squ acres/mile) = 2.5 squ miles)). The distance of an imaginary line from Little Henham southwards to Old Mead Lane is about 2 miles. When squared with a second imaginary line from Old Mead Lane eastwards to a point close to Greenend Farm, which is about 1½ miles, you get an area of about 3 square miles. It may be inaccurate by 20 % but we don’t know how much of Henham was owned by Baynard. By this reckoning, he would certainly appear to have owned almost all of what we call ‘Henham’ today. Coincidentally, the 1851 Census shows that at least 1,880 acres were being farmed/managed. This acreage is about 2.94 square miles. So it appears that the useable acreage in Domesday was probably the same as 150 years ago. Other sources claim that some 80 % of the cultivated land in 1914 was already used for farming at the time of the Conquest. How much of this acreage was being used for crops, livestock, woodland etc is not easy to calculate for a specific location. Fortunately though, all of these activities were done to sustain the same cause - the population. To get a rough estimate of the village population, you can apply the normal multiplier of 5 to every ‘man’ (excluding slaves). Domesday says that there were 23 at the Conquest rising to 46 in 1086. At first glance, the population of Henham at the Conquest may therefore have been about 115 in 1066 rising to 230 in 1086. But these would have to be the maximum presumed figures. It is impossible to show how many of the 23 or 46 were living within the same household as father & son, brothers etc, nevertheless the inter-relationships within a small village meant some of those 46 had to be living under the same roof. Probably not too many less than 46 though. Not many men lived much past their forties then so few would have lived with adult sons. The 1,880 acres of 1851 give a clue as to the ability of the crop production and livestock to support the Domesday population. Divide the 1,880 by the number of ‘men’, 46, and you get 40.9 acres per family just within the range of 40:1,000 acres per hide required to keep a family. The figure of 40.9 indicates that this manor was exceptionally productive despite the supposed renowned ‘Henham clay’. The number of plough teams, twelve, seems to corroborate this figure and, at a rate of 4 per square mile, the approximate area of the village. Melanie Pimblett confirms her family view that the farmland around here is particularly fertile. Yet another way is by calculating the number of winter livestock (mainly the oxen?) by the amount of hay produced from the 16 - acre field. Melanie advises that such an area would produce about 1,600 bales of hay a year. She adds that an ox would eat ½ a bale a day, or 60 bales for the winter period of about 120 days from 1st November until 1st March. So this meadow could only feed 26 oxen, never mind the sheep and cattle, albeit that some of the latter pair would have been slaughtered ready for the winter. There must have been more pastureland that wasn’t declared to the Commissioners. Sufficiently atmospheric to imagine a handful of local cronies concocting a cunning plan at a convivial village location to deceive a Commissioner’s agent ?